Rare but excellent form of Cascades Mahonia that is actually found only in the redwoods of N. California to southern Oregon. A TALL upright growing shrub with thick trunks to 9′ eventually. It forms a clump of stems and can increase by suckering closely to the main clump and sending up new stems. Handsome foliage- pinnate dark green leaves to 1′ + long. In winter the whole shrub takes on great plum purple tones. In mid-spring trailing clusters of yellow flowers are followed by blue berries. 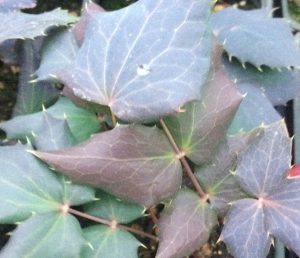 Moderately slow growing evergreen shrub for part shade to dense shade. Established plants take dust dry conditions in shade. Accepts regular summer water as well- in well drained soil that is not compacted. Mulch each year with a coarse bark. Easy to grow. Appearance is very much like the M. x media hybrids. New growth emerges red. High deer resistance. Oregon native plant.